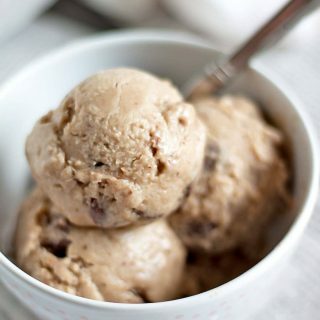 2-Ingredient Banana Almond Butter Ice Cream. 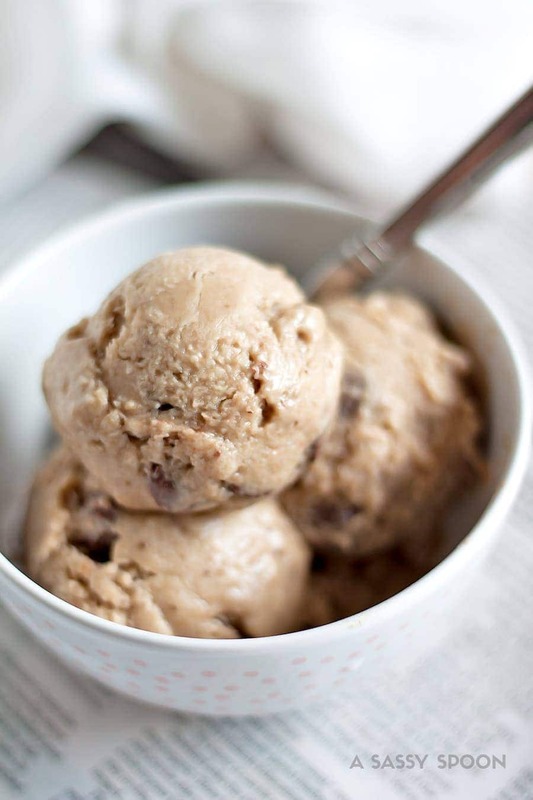 A deliciously sweet no-churn ice cream made with bananas and almond butter! No ice cream maker needed. A great way to use ripe bananas! Don’t you just hate when you have ripe bananas on the counter? Just sitting there. Staring at you. I have an ice cream maker which I love! Making Salted Caramel Cone Ice Cream with it was SO GOOD. Making “nice cream” is definitely easier. All you need is a blender. That’s it! No ice cream maker needed. Grab those bananas, some creamy almond butter, your favorite mix-ins and you’re ready for an ice cream soiree! Also, I highly recommend you get an ice cream tub. Makes transferring the mixture so easy. Plus, it takes up less room in the freezer! Win! This is the ice cream tub I have. I hope you make it and LOVE it! In a blender, add bananas and blend until smooth. Add almond butter. Blend until well combined. Transfer the creamy mixture into an ice cream tub. Fold in toppings, if desired. Place in the freezer for up to 12 hours before serving. When ready to eat, thaw for 10 minutes, scoop and enjoy! If you’ve made this or any other recipe, tag me on Instagram with #asassyspoon or comment below. I’d love to hear from you! Get a FREE weekly meal planner printable plus my go-to meal prep tips by clicking here! Wow, you really can’t get much easier than this! I love the flexibility too, especially with the mix-ins. I’m with you, totally on board with dark chocolate chips! Would it work just as well with 3 bananas? Lol that’s all I have. Sure! Just adjust the almond butter a bit so it’s not too overpowering. Mmm nutty banana ice cream with chocolate. I always have ripe bananas, I have a collection of it in my freezer haha Gosh I wonder how old half of them are. Cripes. This looks so creamy I wouldn’t have even guessed there’s no cream in this! :) Healthy!